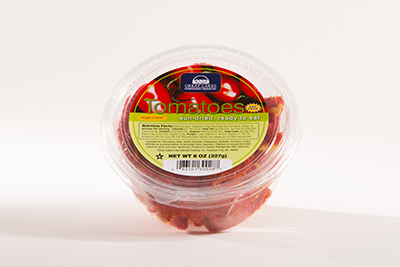 Sun-Dried Tomatoes: 8 oz Vac Pack Tubs « Great Lakes International Trading, Inc. 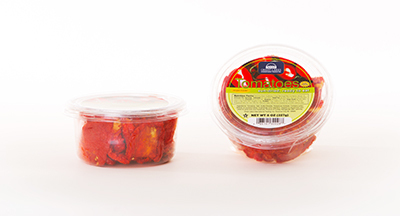 Delicious ready-to-eat Turkish Sun-Dried Tomatoes vacuum packed for freshness in reclosable clear plastic tubs. No prep needed—these tomatoes are ready to eat right from the package. 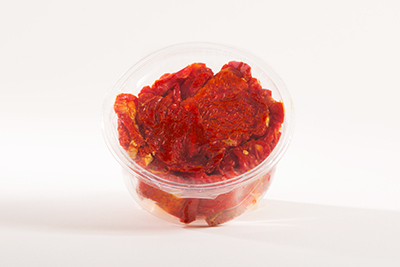 Sun-Dried Tomatoes are an excellent flavor addition to any dish and are wonderful in salads, pastas and sauces! UPC code #0-86101-30028-7. Product of Turkey. Great Lakes item #970. Each carton contains 12 x 8oz. net weight tubs. Each carton measures 14.5”x 9.75”x 4.25″. The total net weight per carton is 6 pounds. There are 100 cartons per standard 40 x 48 pallet.